Is There Value In Value Sketches? Some people don't see the value in value sketches. They like to go straight to the canvas and paint or draw on the canvas, then paint...My process is through black and white value sketches. See six reasons why. Being a full time wife and mother and trying to make art a business is a recipe for chaos. A great and cheap marketing idea...wrong! Well, I didn't know it was illegal. I thought it was a brilliant idea. 20% 0ff on all prints, cards, and phone cases until Oct 31st. Celebrating my first studio tour show. Click the link to view art. Feel free to join my E-MAIL LIST to receive timely updates. Your information WILL NOT be shared and you can unsubscribe anytime. I recently did my first demo. It went okay, well, the first of anything I do rarely goes as planned. Read the story and find out. Never a dull moment in the life of an artist and not always a pretty picture. Find out what goes on behind the scenes of a painting or a show or everyday life. I've been painting a SMALL AND VERY AFFORDABLE ORIGINAL painting almost every day. Come place your bid, see what's new and purchase one HERE via PayPal. It takes 1-5 days to get the painting shipped to the winning bidder after the bidding closes. Some paintings are buy direct through PayPal. See AVAILABLE ORIGINALS gallery and CONTACT me. I use the safe and secure PayPal method for purchases of my originals. 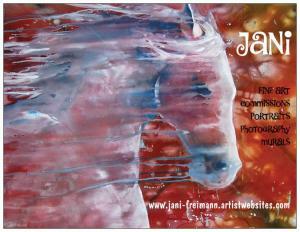 Like my page, JANI FREIMANN FINE ART , and you will see progressive photos of my artwork and news about what I am up to.